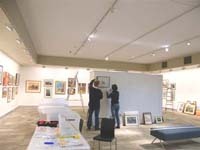 The Gallery Management Committee oversees the running of the Gallery with the help of the volunteer Friends of the Gallery. The Committee, also volunteers, has the responsibility of raising funds, attracting sponsorship and equipping the Gallery. The Friends of the Gallery and the volunteer support which they give are vital to the success of the Gallery. By joining, you will assist the Gallery Management Committee in both a financial and practical manner whilst enjoying what the Gallery has to offer. You will receive invitations to all opening functions and notification of the ongoing program. If you are prepared to assist please contact secretary@romaonbungil.com.au or put your name down on the roster in the Gallery or the Library…..see Tammy.